Mummy Meat Loaves ~ Sweet cherry tomatoes are hidden in the center of these mini-meat loaves, offering a welcome burst of juicy flavor when you take a bite. 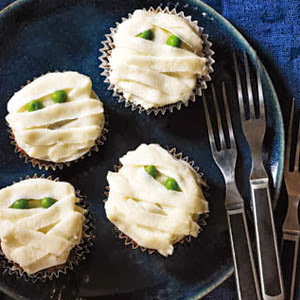 Post Halloween, keep the recipe in rotation by piping the mashed potatoes as you would cupcake frosting. 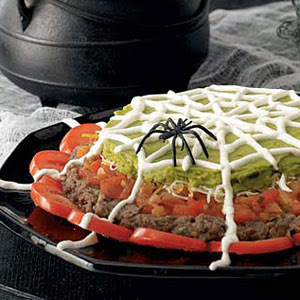 Spiderweb Nacho Spread ~ Give your basic Mexican dip an upgrade with this terrifyingly tasty recipe that layers refried beans with salsa, cheese and homemade guacamole, then finishes it off with a web of piped sour cream. 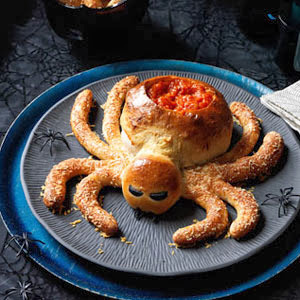 Saucy Spider with Hairy Leg Sticks ~ This eery-looking appetizer is creepy enough for a Halloween bash, but tastes just like a classic kid-favorite — pizza! Make the spider: Cut 1 ball of dough in half. Shape one half into a 5-in. ball to make the spider body. Cut a 1 1/2-in. strip from the remaining half and shape into a 2 1/2-in. ball to make the head. Cut the remaining dough into 8 strips and roll each strip into a 6-in. rope to make the legs. Arrange the body, legs and head on one of the prepared baking sheets to resemble a spider, gently pressing all of the pieces of dough together. Brush the entire spider with some of the egg. Sprinkle the legs with 2 Tbsp Parmesan. Place 2 of the olive slices on the top of the head for eyes and 2 on the bottom for pincers. Bake until golden brown, 25 to 30 minutes (covering the legs with foil if browning too quickly). Meanwhile, make the spider leg sticks: Cut the remaining ball of dough into 8 pieces. Roll each piece into a 3/4-in.-thick rope. Cut each rope into various lengths. Taper one end of each piece and slightly bend the other to resemble legs. Place on the second baking sheet. Brush with the remaining egg and sprinkle with the remaining 1/4 cup Parmesan. Bake until golden brown, 15 to 20 minutes. Meanwhile warm the marinara sauce. Using a knife, hollow out the body of the spider and fill with the warm sauce. Serve with the leg sticks. 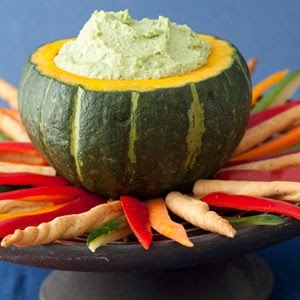 Cauldron Dip ~ What's a Halloween party without a green dip? Ranch dressing is always a crowd pleaser, just play it up in a large acorn squash atop a "fire" of crudité and breadsticks. 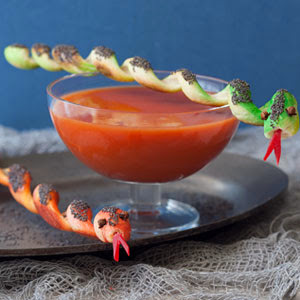 Snakes and Soup ~ Surprise partygoers with a first course featuring a wriggling reptile breadstick garnish. Gliding across a glass bowl of tomato soup, he’s as delicious as he is stealthy. 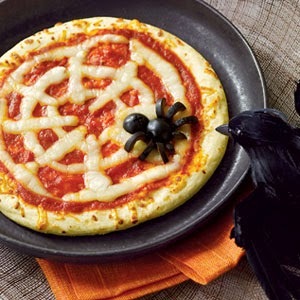 Spiderweb Pizzas ~ Serve up a piping hot slice of spookiness with these super-simple pizzas made with pre-baked crust, pizza sauce, strategically placed string cheese and a black olive spider. Heat oven to 450°F. Place crusts on a baking sheet; top with sauce. Pull cheese into thin strips; place on pizzas in the shape of a web. Bake pizza for 8 to 10 minutes until cheese melts. Cool 3 minutes. Cut off one end of 2 olives for spider heads. Halve remaining olives lengthwise. Use one half for body; cut remaining pieces into strips for legs. Assemble spider on each pizza. 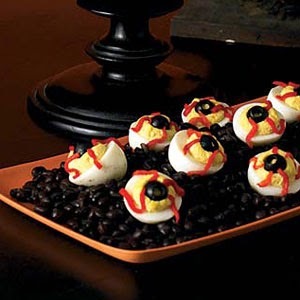 Bloodshot Deviled Eyeballs ~ Whip up a batch of creamy deviled eggs and then turn them into eerie-looking “eyeballs” with a few simple additions: black olive slices for the pupils and thinly sliced pimiento for veins. 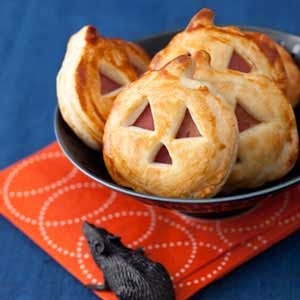 Jack-o’-Lantern Sandwich Bites ~ These golden ham and cheese nibbles are way easier than carving a gourd. Just use a pumpkin-shaped cookie cutter on store-bought pie crust and ham and cheese slices, then layer and bake!